Gumbo was first made in southern Louisiana by the Creole and has become a signature dish in Louisiana cooking. Nothing says Creole like a good gumbo. Consisting of a strong stock, okra, vegetables (peppers, celery and onions), a thickener like filé powder or a Cajun-Style Roux, meat (sausages, fish, shellfish, or poultry) and spicy seasoning. There are a few ways to prepare Gumbo, every family seems to have it’s own version. We shy on the version that let’s the vegetables cook down, and then add the fish (or meat) finishing off with shrimp and finishing spices near the end. Gumbo is served over rice, use brown rice. 5. Once the celery begins to soften add a cup of water, let come to a boil and lower the heat to allow to simmer for a few minutes. 8. Let simmer for 5-10 minutes and then add the cut okra. 10. When the all the liquid has been added, simmer for at least 10 minutes before adding the corn. 11. 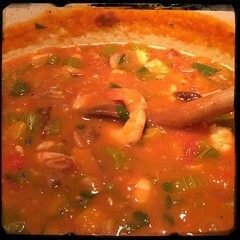 Let simmer for 5 minutes before adding the seafood. 12. Let simmer for 5 minutes before adding the marinated shrimp. 13. Once the gumbo comes back to a boil, lower the temperature and add the roux. Let cook for 10 minutes.